Upon your arrival in Niagara Falls, the first stop is Whirpool Rapids. This will be followed by a much anticipated ride aboard the Hornblower Niagara Cruise, taking you to the base of the Horseshoe Falls. You will then be escorted to the Fallsview Dining Room in the Sheraton on the Falls for a well deserved buffet lunch, while taking in the breathtaking panoramic views of Niagara Falls. 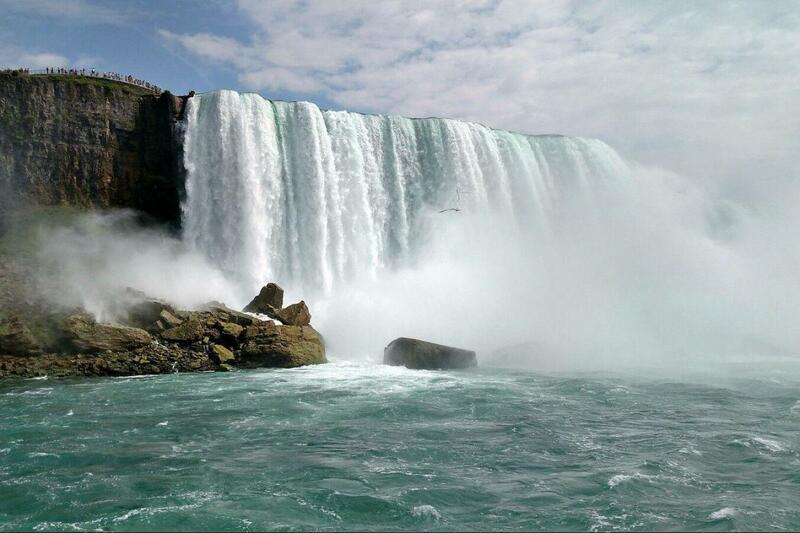 After your relaxing lunch, you will head to the Table Rock Complex to get a closer look at the Horseshoe Falls. Our tour will continue towards Niagara-on-the-Lake and we will visit a winery. Child Policy: Infants aged 4 years and under ride free when accompanied by an adult and do not occupy a seat, unless an unsold seat is available. Child prices are applicable for children aged 5 - 11 years, inclusive of when accompanied by an adult. Sit back and relax aboard our deluxe air-conditioned, washroom-equipped motorcoach as you enjoy the most popular and historical sites of the Niagara region. well deserved buffet lunch, while taking in the breathtaking panoramic views of Niagara Falls. After your relaxing lunch, you will head to the Table Rock Complex to get a closer look at the Horseshoe Falls. Free time is allotted here for additional sightseeing, photo opportunities, and souvenir shopping. Our tour will continue along the Niagara Parkway towards Niagara-on-the-Lake. Once in Niagara-on-the-Lake, you will have free time to explore and soak up some of the history and heritage of one of Ontario’s most famous landmarks. And of course, no tour to the Niagara region would be complete without visiting one of the local wineries, where you can sample some of Ontario’s finest wines. Knowledgeable guide with comfortable bus and friendly driver. Hornblower Niagara Cruse was so wonderful. Lunch buffet was delicious and could see the whole Niagara Falls from hotel. A must day trip when visiting Toronto.